Bengaluru, (Karnataka), [India], Feb 24 (ANI): Defence Minister Nirmala Sitharaman on Sunday inspected the site where over 300 cars, in the parking area of the ongoing Aero Show in Bengaluru, were gutted in fire on Saturday. Bengaluru (Karnataka) [India], Feb 23 (ANI): In order to pay tribute to the fallen pilot, the Surya Kiran aerobatics team of Indian Air Force (IAF) performed at Aero India 2019 here for the first time after the tragedy. Bengaluru (Karnataka) [India], Feb 21 (ANI): Hindustan Aeronautics Limited (HAL) on Thursday said that it hopes to get an order for a squadron of Sukhoi-30 fighter jets which are assembled in the state-owned facility. Bengaluru (Karnataka) [India], Feb 20 (ANI): After over three and a half decades, the Indian Air Force on Wednesday finally agreed that the indigenously developed and built Light Combat Aircraft (LCA) Tejas was combat ready, and received the ‘release to service document’ certificate. Bengaluru (Karnataka) [India], Feb 20 (ANI): Former Vice-Chief of Indian Air Force, Air Marshal SB Deo (retired) offered four missiles of different types to Indian armed forces at the Aero India show on Wednesday. Bengaluru (Karnataka) [India], Feb 20 (ANI): Amid a pall of gloom after two Surya Kiran aircraft collided, which resulted to the death of a pilot, the Surya Kiran team has decided to not participate in the five-day air show Aero India 2019 which begun in Bengaluru on Wednesday. Bengaluru (Karnataka) [India], Feb 19 (ANI): A pilot on board a Surya Kiran aircraft that crashed earlier today died while two other pilots are undergoing treatment at Command Hospital here, the Indian Air Force said on Tuesday. 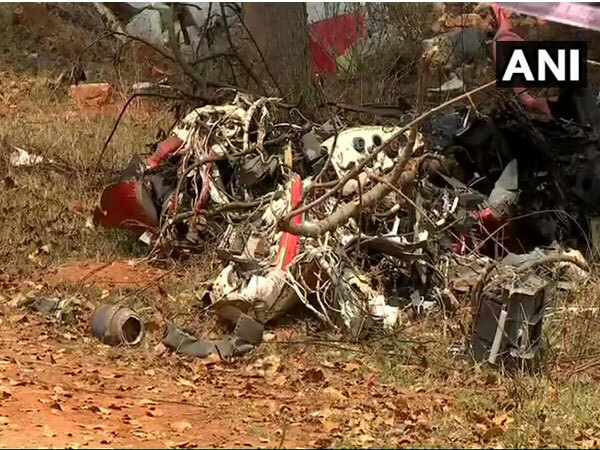 Bengaluru (Karnataka) [India], Feb 19 (ANI): Two aircraft of the Surya Kiran Aerobatics Team crashed at the Yelahanka airbase in Bengaluru on Tuesday. New Delhi [India], Feb 13 (ANI): Three Rafale fighter aircraft of the French Air Force landed in Bengaluru on Wednesday to participate in the ‘Aero India Show’ which is scheduled to be held there. Lucknow (Uttar Pradesh) [Iindia], Aug 14 (ANI): After Union Minister Ananth Kumar said that Uttar Pradesh lacks the infrastructure to conduct the Aero Show, Aviation Minister of the State, Nand Gopal Gupta Nandi, on Tuesday averred that his state is capable of hosting the show. Bengaluru (Karnataka) [India], Aug 13 (ANI): Karnataka Chief Minister HD Kumaraswamy on Monday wrote to Prime Minister Narendra Modi, seeking his approval to conduct Aero India show-2019 in Bengaluru, amid reports of the next edition of the event being shifted to Uttar Pradesh's Lucknow.